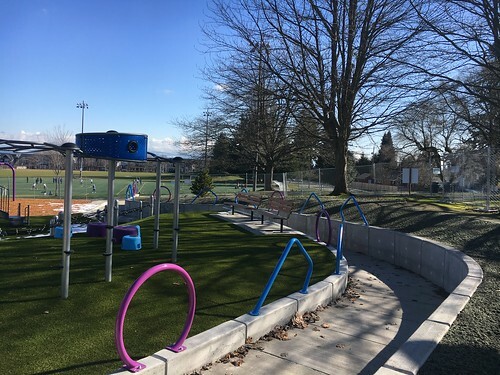 Representatives from Seattle Parks and Recreation, Seattle Department of Transportation (SDOT), Feet First, and the Beacon Hill community cut the ribbon on an improved sidewalk and route to school for Asa Mercer International Middle School on Dec. 1, 2015. 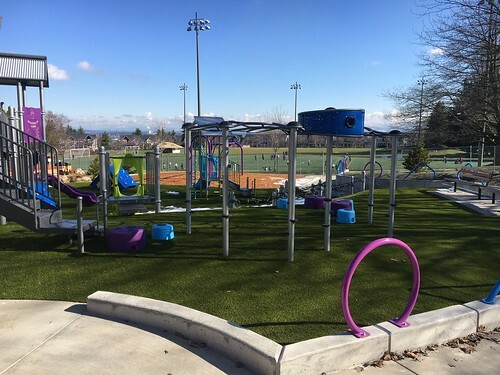 Seattle Parks and Recreation, Seattle Department of Transportation (SDOT), Feet First, and the Beacon Hill community cut the ribbon on an improved sidewalk and route to school for Asa Mercer International Middle School on Dec. 1, 2015. The project improved the sidewalk, drainage, and parking along 16th Ave. S between S Dakota St. and S Nevada St., just west of the Jefferson Playfield. 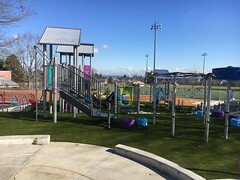 The new improvements were in response to access and safety concerns to increase safety and walkability for the students as well as the community. 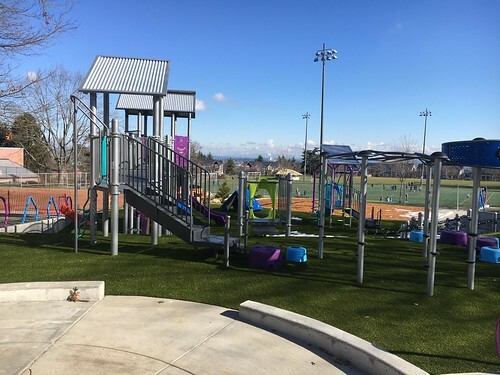 Seattle Parks and Recreation invites the community to the centennial celebration and grand opening of the new golf and community facility at Jefferson Park Golf Course on Saturday, May 16, 2015 from 10 a.m. to 12:30 p.m. Join us for the ribbon-cutting event at 10:30 followed by an 18-hole golf tournament and other golf activities, music, giveaways and light refreshments as we honor 100 years of sport and diversity on Beacon Hill. Seattle’s first golf course, Jefferson Park, is located at 4101 Beacon Ave. S.
Jefferson Park Golf Course’s new clubhouse and driving range open April 11. Grab your clubs rain or shine and head to Jefferson Park Golf Course because the new driving range opens April 11, and it’s ready to be broken in. Guided by the 2009 Golf Master Plan, the Jefferson Park Golf Course renovation is substantially complete and the new clubhouse and driving range will open this Saturday, April 11. The $8.7 investment includes a new clubhouse facility, new putting greens and parking improvements. The clubhouse facility includes a two-story covered and heated driving range, an enlarged and improved food and beverage operation with indoor and outdoor facilities, banquet and meeting rooms, and a large pro shop with club repair and teaching areas. The new facility was built by CE&C and designed by Bassetti Architects. On April 11, the driving range will be open, but the new cafe will still be undergoing final maintenance. For hours and to learn about special April deals, visit http://www.premiergc.com/jefferson. An official grand opening celebration and ribbon cutting is planned for Saturday, May 16. Jefferson Park Golf Course is managed by Premier Golf Centers. Seattle Parks and Recreation encourages all citizens to be good stewards of the environment, and it’s our job to lead by example. Our department has a long history of enhancing the beauty and sustainability of public forests and parks by using diverse and adaptable plants in city landscapes to promote the conservation of native plant and wildlife habitat. Planting season is upon us, and we’re gearing up to put more than 15,000 plants in the ground. So where do our plants come from? And how do we make sure the plants are healthy? The answers lie in the Jefferson Park Horticulture facility on Beacon Hill. Parks’ greenhouse and nursery grow more than 250,000 annual and woody plants each year. The plants are cultivated and then strategically placed in parks and greenspaces where they will thrive. And spreadsheets. The gardening staff have spreadsheets that note the number of plants they need to secure each season, the park they will be located in and the pests that commonly affect those plants. Schorer gets plant requests from each of the park crew chiefs. Some of the plants require only a few months to grow in the greenhouse while others may be there for a few years. The greenhouse is divided into sections by native plants, bare roots, winter annuals, plants for the Home and Garden show and others. In fact, there’s even a sectioned-off plant hospital. This fall when you’re walking on a Parks’ trail and spot a young tree or when you’re admiring the greenery along Bell Street Park, you’ll know the plants probably started as a request on a spreadsheet, grew up in the greenhouse and a senior gardener probably referred to them as “my babies” once or twice. It’s all part of our commitment to environmental stewardship. The third annual Jefferson Park Jubilee is on Saturday, September 13, 2014. This popular community festival organized by the Beacon Hill Merchants Association will begin at noon and run until the park closes. Jefferson Park is located at 3801 Beacon Ave S, a 10-minute walk from the Beacon Hill light rail station. This year the Jubilee is proud to collaborate with the Beacon Food Forest’s Opening Celebration, marking the creation of permaculture gardens in Jefferson Park. 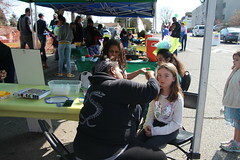 The combined events will feature a world music stage, community dance groups, food trucks and booths, craft vendors, informational tables, speakers and tours, and kids’ projects and games. Attendance is expected to be between 3,000 and 5,000 people. For more information, please visit www.jeffersonparkjubilee.com and www.beaconfoodforest.org. Saturday, June 21, was International Go Skateboarding Day and to celebrate, Jefferson Park received a hefty gift. Measuring 50 feet wide and 22 feet tall, colored bright red and weighing in at 11,000 pounds, the new Red Bull Skate Space in Jefferson Park is hard to miss. Seattle Parks and Recreation, Red Bull, 4Culture, professional skateboarders Torey Pudwill and Ryan Schekler and others unveiled the permanent skateable art on Saturday with a community celebration. In the summer of 2013, Seattle Parks and Recreation, 4Culture and Red Bull conducted a call for artists to create a public art piece that would accommodate skateboarding. Forty artists applied and after an extensive interview process Oregon-based artist C.J. Rench was chosen to produce the skateable art piece. Seattle Parks and Recreation, Red Bull, 4Culture and professional skateboarder Torey Pudwill are excited to unveil a permanent art sculpture that is “skateable” by skateboards in the northeast corner of Jefferson Park, which is located at 3801 Beacon Ave S, Seattle 98108. The Red Bull Skate Space, designed for the City of Seattle, will be opened in Jefferson Park on International Go Skateboarding Day, June 21, 2014, 11 a.m.– 2 p.m. Pro skateboarders Torey Pudwill, Ryan Sheckler, Felipe Gustavo, Tom Schaar, Alex Midler, Ryan Decenzo and Joey Brezinski will attend the unveiling. C.J. Rench began designing, sculpting and fabricating metal sculpture full-time in 2005, working mainly with large-scale abstract design that reveals his dimensionality. His work, primarily in stainless and mild steel, is diverse, ranging from small tabletop hand-painted sculpture to monumental public installations. He and Torey Pudwill began designing and fabricating the Red Bull Skate Space together in early 2013 and will officially begin installation in Jefferson Park on June 18, 2014. “Working with Torey and Red Bull to create art that invites interaction and participation has been a dream project,” Rench says. “This project is a true collaboration with art and skateboarding, and Seattle is the perfect city to host this innovative work of art,” says Pudwill. Red Bull Skate Space will be permanently located in Seattle’s Jefferson Park. Considered by many as one of Seattle’s most enjoyable destinations, Jefferson Park is the sixth largest park in the city and offers unparalleled views of the Duwamish River, downtown and the Olympic Mountains. Jefferson Park is a designated District Skatepark location in Seattle’s Citywide Skatepark Plan http://www.seattle.gov/parks/projects/Skatepark.htm. The Citywide Skatepark Plan identifies a network of safe, legal places throughout the city that can begin to change the way people think about and experience skateboarding in Seattle. Visit http://www.redbull.com/us/en/skateboarding/stories/1331656219734/torey-pudwill-skate-space-in-seattle for updates and more information. Work on Jefferson Park Golf Course is set to begin mid-November 2013. The project includes a new clubhouse and improvements to golf services, and provides community space for non-golfers. Seattle Parks and Recreation expects work to be complete December 2014. The course will remain open throughout construction and Seattle Parks will continue to offer as many services and amenities as possible. Temporary facilities for the pro shop and food service will be located across Beacon Ave., behind the existing first tee. Efforts are being made to keep the driving range partially useable. Jefferson Park Golf Course’s new two-story clubhouse will include a banquet hall, a café with outdoor dining, a pro-shop, and teaching space. A double-deck driving range will be built. Improvements will be made to paths, the cart bard, and parking. The $7 million Jefferson Golf Course improvement project is part of the Golf Master Plan. In 2006, Seattle’s City Council adopted Golf Financial Policies (Resolution 30926) which call for golf revenues to be used to support operations and maintenance of the courses, transfer 3.5% of gross revenue to the Park fund to support overhead costs, and set aside the remainder for golf capital improvements. Built in 1915, Jefferson Park Golf Course is situated in Seattle’s Beacon Hill neighborhood, just south of downtown. The course, measures over 6,200 yards and features vistas of the city’s skyline and Mount Rainier. It is maintained by the City of Seattle and managed by Premier Golf Centers LLC. Jefferson Park includes an 18-hole and a 9-hole golf course, a restaurant with banquet facilities, and a driving range. Instruction is available for golfers at all levels. 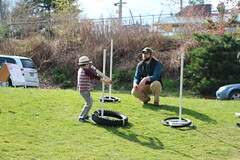 For more information on the Jefferson Park Golf Course improvements, please visit http://www.seattle.gov/parks/projects/jefferson_golf/. 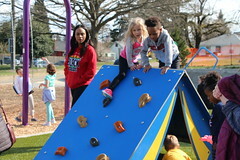 For more information on the Golf Master Plan, please visit http://www.seattle.gov/parks/athletics/golfcrse.htm#plan. If you have questions about the project, please contact project manager Toby Ressler at toby.ressler@seattle.gov. Seattle Parks and Recreation and the Veteran’s Administration Health Care System Puget Sound (VAHCS) invite the community to a public meeting on August 27, 2013 from 7 – 8 p.m. at Jefferson Community Center. At this meeting the community can learn about the new emergency access road construction and removal of white poplar trees on the edge of Jefferson Park. Jefferson Community Center is located at 3801 Beacon Ave. S.
Removal of 22 white poplar trees between VAHCS and Jefferson Park is necessary due to root loss associated with the VAHCS construction of an emergency access road. The poplar trees were in poor condition prior to root damage and road construction will necessitate removal. VAHCS will be funding all the work and agrees to restoring the landscaping and planting trees on Parks property at a 2:1 ratio per City specifications upon completion of the road construction. For more information about the project please contact Michael Yadrick, Seattle Parks and Recreation at 206-684-4113 or michael.yadrick@seattle.gov. Seattle Parks and Recreation is hosting a public meeting to gather input on a proposed public art piece at Jefferson Park that will be skate-able. The meeting is at 7 p.m. on Monday, July 15, 2013 at Jefferson Community Center located at 3801 Beacon Ave S.
Red Bull and X Games bronze medalist Torey Pudwill approached Seattle Parks and Recreation about commissioning an artist to design and fabricate a unique piece of skate-able art for Seattle. Parks worked with Red Bull to choose a suitable park for the art. Artist CJ Rench from Hood River, Oregon, was selected from an Open Call to Artists to fabricate the piece. Seattle Parks will work with Mr. Rench to make sure that the design and size of the art piece is appropriate for the location. At the meeting, Seattle Parks will present the history of the proposed project, proposed placement options in the park, introduce the artist and gather input from the community. CJ Rench will discuss his ideas and answer questions. Red Bull representatives will also discuss the project. Jefferson Park is located at 3801 Beacon Ave. S. The Jefferson Park Skatepark opened in early 2012 and features the deepest bowl in the City.